The best selling shirt in Line history is now found in a Pullover form. 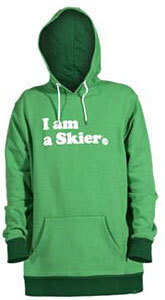 The most popular saying: "I am a Skier" will certainly be a big hit among skiers not wanting to be confused with snowboarders. With a Rider Fit you will enjoy the way this Hoodie fits.